If you were one of the people that pre-ordered the highly anticipated Complete Selection OOO Driver and were wondering where all those Core Medals were gonna go, worry no more! 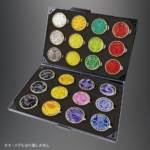 In case you missed it, Bandai teased that a Complete Selection OOO Medal Holder was in the works and the pre-order page for said piece finally went live today and with that, we have new photos and pre-order info. The Complete Selection Modification OOO Medal Holder will retail for a modest 3,760 yen before middleman fees and shipping. It will ship out sometime in August 2018. Tamashi Nations 2017 Reveals: S.I.C Lord Baron, S.H.Figuarts Cross Z And MORE! The much anticipated and teased about Tamashii Nations 2017 is finally here, and we’re kicking things into high gear with a plethora of new reveals for Ultraman and Kamen Rider. First off, on the Shinchokou Seihou front, two of Kamen Rider W’s forms were shown: Heat Metal, and Luna Trigger. For Showa Rider fanatics, there’s the announcement of Kamen Rider 2, New Cyclone, and a Shinchokou Seihou Kamen Rider Amazon to round things off. In addition to that, we have our first look at the next S.H.Figuarts Kamen Rider Build releases: Machine Builder and Kamen Rider Cross Z! For Ultraman collectors, we have a trio of Ultraman Geed-related S.H.Figuarts with Ultraman Geed Royal Megamaster, Zero Beyond, Belial Atrocious, and Imit-Ultraman. 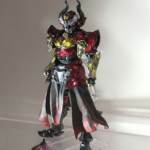 We have new S.I.C too with the next batch of Kamen Rider Gaim S.I.Cs on display: Lord Baron, Baron Lemon Energy Arms, Kamen Rider Marika, and Ryugen Yomotsu Heguri Arms are present. Finally, Tamashii Lab’s next product was revealed to be a replica of Anhk as a floating arm. Tamashii Nations will be an ongoing event, so there’ll be more announcements over the course of the weekend. So stay tuned, we’ll continue to provide more info as it’s made avalaible. 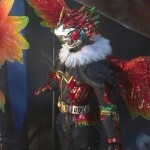 Continuing the releases from Kamen Rider OOO, the samples of Love Combo, Tamashi Combo, and Super TaToBa appeared at the Tamashi Nation show room in akibabara. In addition…two more Greeds in this aesthetic were revealed: Mezool whom appears as a statue, and one for fan favrioute Anhk. Sadly, there is still no word if these designs will ever be released to the public in someway.